UFC 173 got a new main event when middleweight champion Chris Weidman was forced to postpone his scrap with Lyoto Machida to undergo knee surgery, so it’s only fitting the show will also get a new co-featured attraction. Kevin Iole of Yahoo! 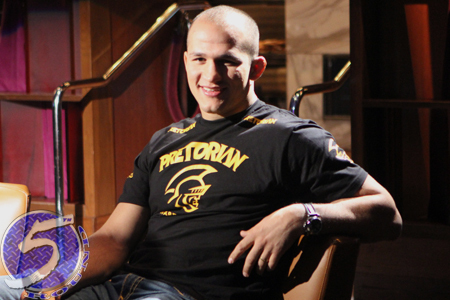 Sports confirmed with UFC president Dana White Monday that the heavyweight shootout between former champ Junior dos Santos (pictured) and Stipe Miocic will now headline the UFC’s May 31 promotion in Brazil. That card’s former showcase bout between bitter rivals Chael Sonnen and Wanderlei Silva will now co-headline UFC 175. No word on why the changes were made. Perhaps, the UFC is hedging their bet just in case Weidman can’t return from his recent knee surgeries in time to meet Machida on July 5. Currently, bantamweight king Renan Barao defends his crown against T.J. Dillashaw in UFC 173’s main event. With the exit of dos Santos and Miocic, the next biggest fight in the lineup is the welterweight affair with Jake Ellenberger and Robbie Lawler. However, that doesn’t necessarily mean the 170-pounders will now automatically serve as the night’s new co-main event. White told Yahoo! that he’s “not done” working on the May 24 roster.